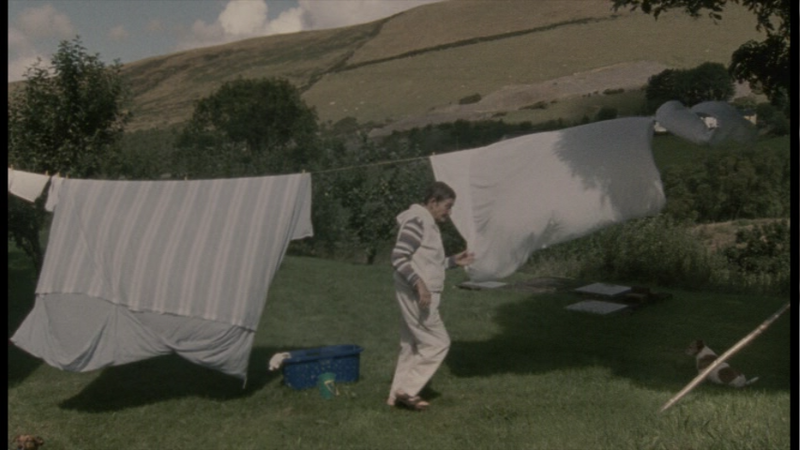 Made in 2007, Sleep Furiously documents life in the Welsh village of Trefeurig. It’s a documentary without a narrator, although once in a while someone will acknowledge the camera — like the man who recites his poem about the signpost that gets blown around by the wind. Most of the time, the film captures people going about their nonindustrialized agrarian ways. The film returns to a bookmobile as its touchstone. The bookmobile drives across the hilly countryside, visiting its elderly patrons, delivering its monthly dose of cookbooks, computers-for-dummies books, popular fiction, and stories written in the Welsh language. The residents of Trefeurig sing in a choir, walk the countryside, farm, birth piglets, and enter pies and pets into the local fair. If there’s a long-range story arc, it involves the locals fighting a school closing, which would also mean a loss of their community center. Sleep Furiously is lovely and comforting. The landscape is unspoiled and the camera backs way off to let it fill the screen. Walkers get dwarfed as they traverse the wide screen and the bright yellow bookmobile stands out from the green hillside as it zigs its way down to its next stop. Because there is no narrator, it takes a minute for a scene to play out. For example, hay gets baled into big rolls that are then wrapped in plastic. It takes a minute or two for the wrapper to do its work, and the camera just watches until we understand how it works. Director Gideon Koppel shows many snippets of village life. A night scene of teens partying plays in low-rez darkness (to Aphex Twin music!). Pigs are born and raised. The craftsman taxidermist takes on a restoration project. The choir practices. A matron hangs out her laundry to dry. I didn’t fall in love with Trefeuring like I did with Pennan (the location for the fishing village in Local Hero), but I loved the way of life. Take agriculture: there was a lot of it, and none of it was operating on a gigantic industrial scale. The locals harvest their own crops, not cheap migrant labor. There are no cruel steel warehouses for the pigs. There is a large concrete room for milking cows, but it doesn’t look like an assembly line. Their agricultural life looks honest, hard, and very human-sized. Sleep Furiously often reminded me of another recent documentary called Sweetgrass, about the last of the Montana sheep farmers. Their way of life was hard, honest, not yet industrialized ... and unfortunately, doomed. In contrast, Sleep Furiously doesn’t acknowledge that it’s documenting a way of life that is dying. But it’s apparent from the DVD that the disappearance of the old ways from Trefeurig is what inspired the film. Though a love of Wales and Welsh culture may have inspired Sleep Furiously, it’s a love song to a way of life that will resonate with farmers and their descendants all around the world. The sole extra feature on the DVD is “A sketchbook for The Library Van,” a one-hour documentary that is the precursor to Sleep Furiously. It’s shot in black and white, with subjects standing in front of a white backdrop and talking about their lives in the village. It also has footage of the bookmobile. It’s not as visually interesting as Sleep Furiously. It feels more like documentation than documentary. The first hint that something wasn’t right was a series of stripes in a solid red field. It looks like a digital or optical artifact of some sort. Once I started paying attention I noticed that colors weren’t vivid, as though there were no post-production color correction? Was it a lack of funding, or a philosophical decision not to “cheat”? 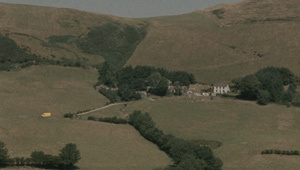 I had to fight my temptation to take a screen shot into Photoshop and make the countryside look more vividly green. Pop in the disc and watch Sleep Furiously. Do not adjust your set; it’s the disc. If you fall in love with the village, return to watch the extra documentary.